KOBOLD PAS Heavy Duty Pressure Transmitter with scalable pressure calibration and output signal. Customizable span from -14.7 to 21 PSIG to 0 to 8700 PSIG. Stainless Steel, Hast-C or Tantalum. 4-20mA output. Gauge or Absolute Pressure sensors. HART communication. IP 67. ATEX and FM approvals options. Self-Diagnostic Function: Sensor, Memory A/D Converter, Power etc. 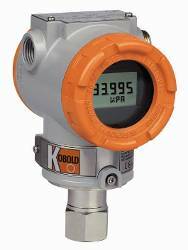 The KOBOLD Pressure Transmitter model PAS is a microprocessor based high performance transmitter, which has a scalable pressure calibration and output signal. It automatically compensates for ambient temperature and process variables. Communication with the instrument and configuration of various parameters is possible via HART� protocol. All of the sensor's data is input, modified and stored via EEPROM. The Electronics module consists of a circuit board sealed in an enclosure. There is an MCU module, an analog module, an LCD module, and a terminal module within the transmitter. The MCU module acquires the digital value from the ana- log module and applies correction coefficients selected from EEPROM. The output section of the MCU module converts the digital signal to a 4...20 mA output. The MCU module communicates with the HART � -based configurator or con- trol system, such as DCS (Distrubuted Control System). The power section of the MCU module has a DC-to-DC power conversion circuit and an input/output isolation circuit. The LCD module plugs into the MCU module and displays the digital output in a user configured unit. The pressure transmitter model PAS is available as a piezo- resistive pressure transmitter which measures gauge pressure as well as absolute pressure. The sensor module converts the resistance into a digital value. The MCU module calculates the process pressure based on this digital value. For connecting the model PAS to different process connections, diverse diaphragm seal versions are necessary. They can be connected to the pressure transmitter directly or via a capillary tube. Depending on the application; different combinations of diaphragm seals, capillary tubes and fill fluids are possible. To clarify those possibilities, the special connections via diaphragm seals should be requested separately from the pressure transmitter.